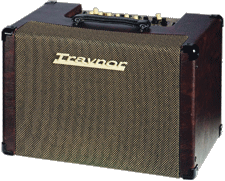 Effective simplicity and precise reproduction are two of the design criteria Yorkville Sound set for this new line of Traynor Acoustic Master amplifiers. Acoustic-electric guitarists and others will be pleased at the neutral response available with minimal control adjustments. Active filtering circuits allow effective tonal shaping with fewer knobs and switches so you get the sound you want quickly, easily and without feedback. Inside, high-grade glass epoxy circuit boards, low-noise metal film resistors and jacks with gold plated contacts ensure quiet, reliable performance onstage or in-studio. Outside, you will find heavy-gauge metal speaker grilles, rugged plywood construction and distinctive Buggy Whip leatherette covering. Flagship of the Acoustic Master line, the AM Custom is an advanced, 3-channel mixer/amplifier/monitor designed to precisely reproduce acoustic guitar or other acoustic instruments, also vocals and line-level music sources and all in stereo. A total of 225 watts of clean power is distributed to a long-excursion, 8-inch woofer and dual neodymium dome tweeters mounted on an angled internal speaker baffle for enhanced sound distribution and stereo separation. Features also include 1/4-inch/XLR "combi" mic/line inputs with 48v Phantom power available for condenser mics on channels 2 & 3 (it does not affect dynamic mics, instruments or line inputs if you opt for them),also insert jacks for patching outboard effects, EQ, etc. into specific channels, 4-band channel EQ's with frequency-tuneable Notch filters to control feedback, dual independent 24-bit Onboard digital Effects processors with Footswitch bypasses, an Auxilliary 1/4" input with its own Gain control for connecting a PA or recording desk monitor feed, RCA auxiliary inputs for a CD or MP3 player and a choice of pre- and post-EQ balanced Line Outputs with a Ground Lift button to defeat loop hum. Note: model TB1 tilt-back legs available as an accessory. • Aux. 1/4-Inch Input - bypasses the Line Outs to eliminate gain loops when used as a monitor feed input. Also accepts instrument inputs. • Master Volume - Controls all levels except 1/4" Aux. I have had this amp for a few years and have played it with my Yamaha LL16 with a Bags pickup in it and it sounded to me the best acoustic amp I have ever heard. I can dial up any sound I want for any song that needs a bit of effects. It shines with how much control over the sound the guitarist has. I recently bought the Epiphone EJ-200 SCE and wow does this amp rock. With having the options of two different picks ups and being able to run them both at the same time with different cables and have my amp with its individual channels and each channel has its own effects and controls you can dial in each one with what you want. The sound is absolutely bar none to my ears the best acoustic sound out there. Every one I play my set up to say how really good the sound is.. These two pieces of gear are made for each other.. I love it for my acoustic guitars but wait until you put your acoustic bass through it! This is follow-up to my previous review. I just bought a second one to run in stereo. This is the live sound I've been looking for over the years. Truly an amazing amp!! It's amazing this amp has not had more attention!! You will not be sorry. I have also owned and/or played more acoustic amps than I care to mention. This is by far the best sounding of all the amps I've tried. It is extremely clear and warm sounding. The 4-level parametric EQ (with both low-mid and high-mid knobs) is a huge plus. The effects are so-so. I like the reverb and being able to dial in a longer decay, since I like long reverb. The other effects are fair. I wish there was a way to add stereo options...the only way is to own two and run them in stereo...but these amps are so good sounding and are so well built, two amps would not be bad. A real keeper. You will not be disappointed!!!! This is the best acoustic amp I have ever owned or played....and I have owned or played more than I care to mention. Everything about this amp is first class...the sound, the looks, the features. Only minor drawback is that there is no option to attach another speaker cabinet. Other than that...flawless. This one is a keeper!! I'm so fussy it's embarrassing. However this amp simply sounds great and has everything I need to perform. The tone is very neutral and both my guitars sound like they should. The FX are over kill, but who knows what I'll need or want tomorrow. I could have bought an AER but if i can support a Canadian Builder I would rather do that. I rented one of these puppies recently and will save up to buy one! I was impressed with the overall warm tones you can get without that false preamp sound that most acoustic amps give you. I think the biggest compliment that you can give this amp is that it sounds really natural. I was also impressed with how clean the mic preamp was. There wasn't hiss that nasty hiss you get when you push a mic pre. It sounds like you should. It makes me want to play more. The one complaint I have is that you can't turn the effects off the guitar channel without also loosing our vocal effects.